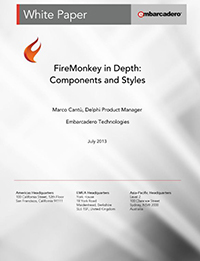 This paper offers a deeper look into some of the key elements of the FireMonkey architecture, namely components architecture and the role of styles in this user-interface library. We'll see how styles define controls, look at the different sections of the FireMonkey class hierarchy, see how you can customize individual components, as well as how to write your own. Understanding styles is key to working profitably in FireMonkey, and this is why this paper has such a specific focus. After submitting the form you will receive an email with a download link for the whitepaper.